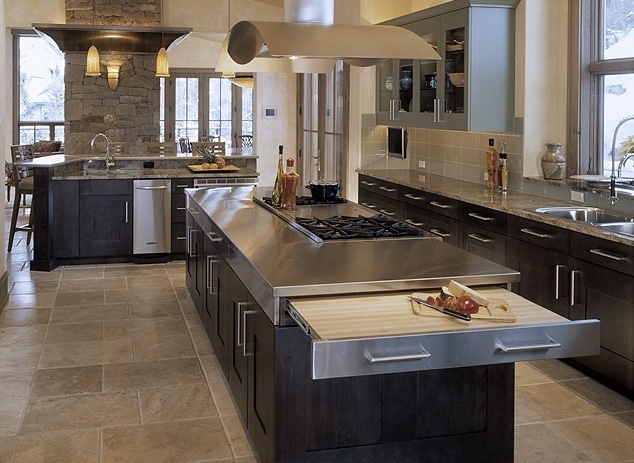 Whether you are reconfiguring an existing kitchen or starting off with a clean slate, a functional layout is key. To ensure that your kitchen is designed properly, you must first think about how you will be using the space. Is your existing kitchen designed in the “work triangle” layout? According to this article, the work triangle was developed in the 1940’s for people who generally had smaller sized kitchens. It has been a staple of the kitchen design world ever since. The concept of the work triangle is, if you drew a straight line from the sink, to the refrigerator and stove, you would have a triangle shaped path. This should make meal prep more efficient and take less time. According to this plan, there should be no less than four feet between each object and they should be no more than nine feet apart. The total of the tree sides should equal no less than 13 feet and no more than 26 feet. Lately, some designers are getting away from this idea, due to the increase in larger sized kitchen. The next point below will discuss this further. How many people will be cooking at one time? Many people are opting for larger kitchens in the past and often there is more than one person preparing meals at the same time. To prevent the kitchen from getting overcrowded and still be efficiently laid out, homeowners are installing additional appliances. For instance, some may prefer to add a smaller prep sink along with their traditional sink. Others may prefer to add a range in the island and install a double oven on the wall. Another option is to add a smaller refrigerator in an island for beverages and quick snacks, while keeping the large one in place. Will the children be doing their homework in the kitchen? If you have children who are always in the kitchen after school, consider an island or peninsula with bar stool seating. This will help the kids stay near you if they have questions, or they can easily snack without disturbing the cook. You will also be able to set the table for meals, without making them move all of their books and papers. Is there sufficient lighting and/or windows? A bright and airy kitchen makes the heart of the home feel so cozy. If you are remodeling, consider your current window placement and the amount of light that gets in the space. You may decide to replace your existing windows with larger ones or possibly add a window. Sometimes, just updating the window treatments can make an enormous difference in the lighting. You will also want to ensure that there is plenty of light after the sun goes down. You may want to add more fixtures to your existing layout or update them completely and use a brighter bulb. Will you be entertaining and need additional seating for those times? If you plan on entertaining or hosting holiday meals, you want to take that into consideration. Be sure that you have space allowed for a table that expands to seat all of your guests. Another option is to add a peninsula or island with additional seating. Now that you have a basic guideline on creating the kitchen of your dreams, you will have something to refer back to. If you are planning on remodeling your kitchen or starting from scratch, a consultation with an experienced designer is a must. You will be able to discuss your vision for the end result. The designer will give you input on ideas you may not have considered, making your project even better than you expected. 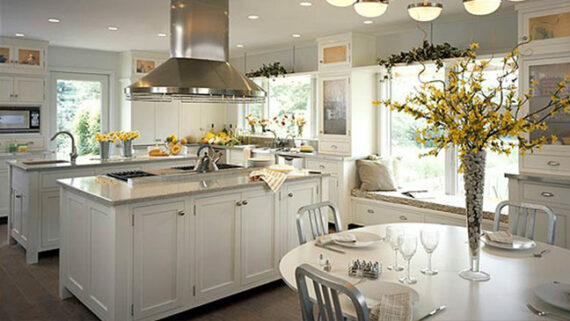 For further reading, check out: 4 Questions To Ask Your Designer and 6 Tips For A Better Kitchen.